Good morning and welcome to our Daily FX Report. Today we expect some very interesting economic data from the U.S., which hopefully give some important information about the condition of the World’s biggest economy. However, we wish you a successful trading day. The USD/JPY strengthened in the early Tokyo trading hours by the most in almost seven weeks caused by a Bank of Japan statement which said today, that the central bank will seek to limit the currencies gains having the JPY touched a 14-year high against the USD last week. Japan’s Prime Minister Yukio Hatoyama will meet the BoJ-Governor “soon” to discuss quantitative easing policies in addition to falling prices and the stronger currency. Business activity in the US rose in November unexpectedly as orders climbed and signaling that the economic recovery will carry through into 2010. The ISM said in Chicago that its barometer rose to 56.1, the highest level since August 2008. The EUR/GBP increased as a U.K. report showed unexpectedly that the national consumer confidence weakened for the first time since 10 months. The GBP dropped against all 16 of the most traded currencies. The Reserve Bank of Australia raised its key interest rate by 25bps. Nevertheless the AUD/USD fell during the Asia session to 0.9122 at its lowest level. The GBP/USD traded close to a bullish trend-line since the middle of October until it lost the support one month later. 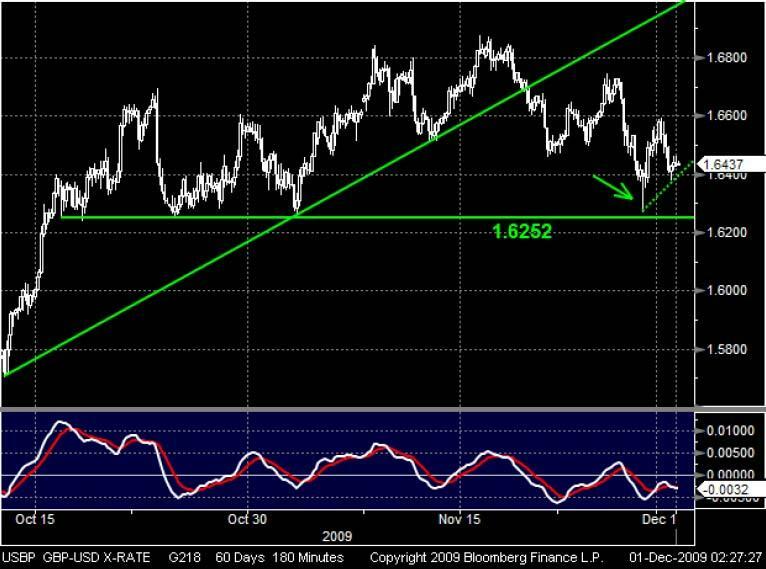 Having the currency pair crossed the trend-line it rebounded and fell near to its important long-term support at 1.6252. It remains to be seen if this long roving Doji may herald a new bullish trend. Otherwise we have to allow for further throwbacks near to its longterm support. 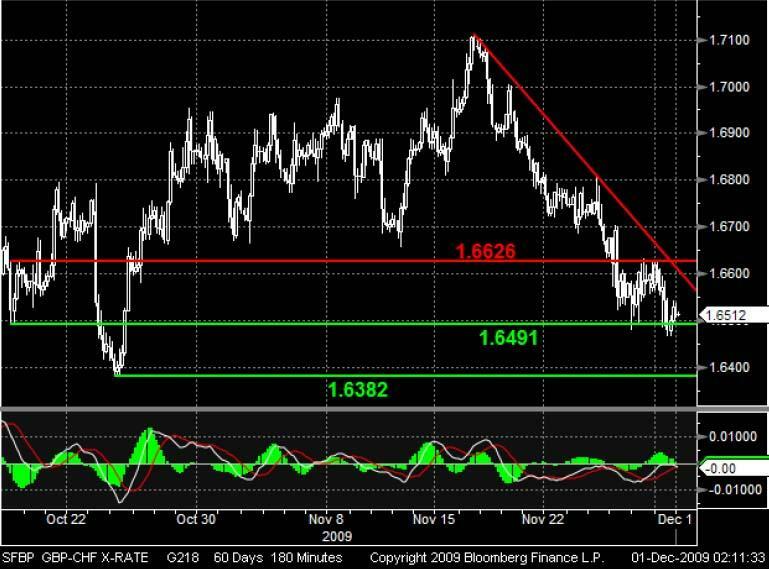 Since the middle of November the GBP/CHF has been trading along a strong bearish trend-line and fell to its support at 1.6491 at least, where it tried to build a new basement. Though the MACD indicator failed to cross its zero-line and could lead to further declines. If the support will break, the next support is located at 1.6382.